Are there any tax implications for a Canadian citizen who is the beneficiary of a US IRA? In Canada, the liability for Canadian income taxes in based on residency and not on citizenship. Assuming you live in Canada and have taken up residency, you will be liable for income tax on your worldwide income. For more information on Canadian taxation and residency, please see Who Is Required to Pay Canadian Income Taxes? The U.S. Individual Retirement Account or IRA is similar to the Canadian RRSP in that contributions may be made and can grow tax deferred. When a person starts taking regular distributions from their IRA account the income typically qualifies as pension income under the Canada-U.S. Tax Treaty. Under the treaty pension arising in one country (the IRA account in the U.S.) and paid to a resident of another country (the owner is in Canada) is taxable in the country of residence. Therefore, the distributions received from the IRA account to an account owner in Canada would be added to the account owners’ Canadian income for tax purposes. The distributions from the IRA account would also be subject to a 15% U.S. withholding tax at source. The full gross amount of the payment is included in the taxpayers’ income and a credit is available for the withholding tax. This means that if a Canadian resident receives $1,000 USD a month from their U.S. IRA, they will receive cash payments of $850 USD per month. The taxpayer would then include the full $1,000 as pension income on their tax return and claim a tax credit of $150 for the foreign tax withheld. If the IRA account holds securities and the account holder resides in Canada, U.S. securities regulations may limit your ability to make changes to the investments in the account. The laws of the particular state may not allow buys or sells or may only allow sells and thereby limiting your ability to make changes. Check with the IRA plan provider to determine any limits on investment changes after becoming a resident of Canada. If your ability to make changes is limited you may qualify for a tax free rollover into an RRSP. There are costs and penalties in the U.S. for doing so but may make sense in the long run. See Moving Your IRA or 401(k) to Canada. 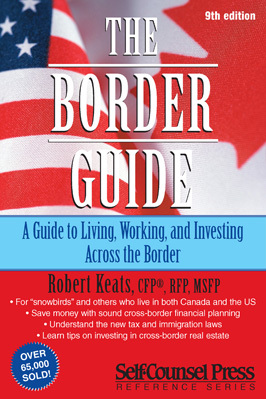 The Border Guide is an excellent reference and is available at chapters.indigo.ca. Tax on Distributions From An IRA to a Canadian. The question is, how is the distribution treated for Canadian tax reporting purposes when a lump-sum as opposed to a periodic payment is distributed from an IRA. Is it treated in the same way – that is 15% withholding on the US side, report the full amount as income in Canada, and claim the Foreign Tax Credit? The lump-sum payment from an IRA would be either subject to a 30% withholding or subject to regular U.S. tax rates if owned by a U.S. citizen residing in Canada. In addition, if the account owner us under age 59.5, an additional 10% penalty tax applies. Other than that everything is treated the same. Tax Guy, thanks for the prompt response. I have dual Canadian/US citizenship, live in Canada and have inherited money that was in my father’s IRA. Can this be rolled into my RRSP? Is it subject to the 30% withholding as noted above, even if I place it directly in my RRSP? Thanks. Any amount paid out of the IRA is taxable to the beneficiary in Canada and does not qualify for a rollover to an RRSP. As a result the payment is fully taxable in the beneficiary’s hands and they can contribute to their RRSP subject to their RRSP contribution room. can you name a canadian resident as a beneficiary of an ira? none have an american social security number and none of the earn money or pay taxes in usa. Yes. You can name a Canadian resident as the beneficiary of an IRA account. Yet another IRA transfer question by a Canadian inheriting a US IRA. Why can’t Canadians apply for the 30% withholding tax to be given back to them, is it not similar to lottery winners or casino winners asking for the $$ back the government takes off the top when Canadians win $$ in the USA? Also, are there any additional penalties or fees for taking a lump sum payment? ie. any estate taxes? I understand then that the lump sum must then be subject to Canadian income tax. Other than contributing some of this lump sum to an RRSP to reduce tax, are there any other suggestions you have to reduce any additional taxes? Additionally, if Canadians are given money or gifted money by friends or relatives, I understand this amount is not taxed. Can a Canadian transfer the IRA to a US friend and have them simply give us the money or gift it to us to avoid paying the Canadian income tax? Should Canadians have the lump sum transferred to an offshore account to avoid taxes, and then withdraw that money overseas? Just looking for ways to avoid seeing this lump sum whittled down to a lump of coal. Yes you can file a US tax return and apply for a refund. It is not easy and depending on the circumstances, you may get all or some back. However, it’s still taxable in Canada. As for the offshore thing, that will land you in very hot water in Canada since residents are required to report and pay tax on worldwide income. Failing to report has very stiff penalties at best … at worst, it could land you in jail! It’s not that you “should”, but there is nothing stopping you. However, if your personal effective tax rate, including the withdrawal from the U.S. is more than 30%, you’ll be incurring a lot of time and headaches for nothing. The foreign tax credit will offset a large part of the U.S. tax. If your tax rate is below 30%, then filing the U.S. return will help. Filing a US return is not easy. Their tax system is convoluted and may need to acquire a tax ID. If you want to contact me, I can help with the filings. I have been working in the US for 4 years. I’ve been filing both Canadian and U.S. returns except last year, I didn’t file a Canadian return; since it seems I am a US resident. I’ve continued to contribute to RRSPs, knowing I would only get the tax benefit on return, but wonder if i should be instead contribute to IRAs. I do plan to return to Canada eventually. I have room in my RRSPs.